Easy and delicious chicken skewers with the best dipping sauce! 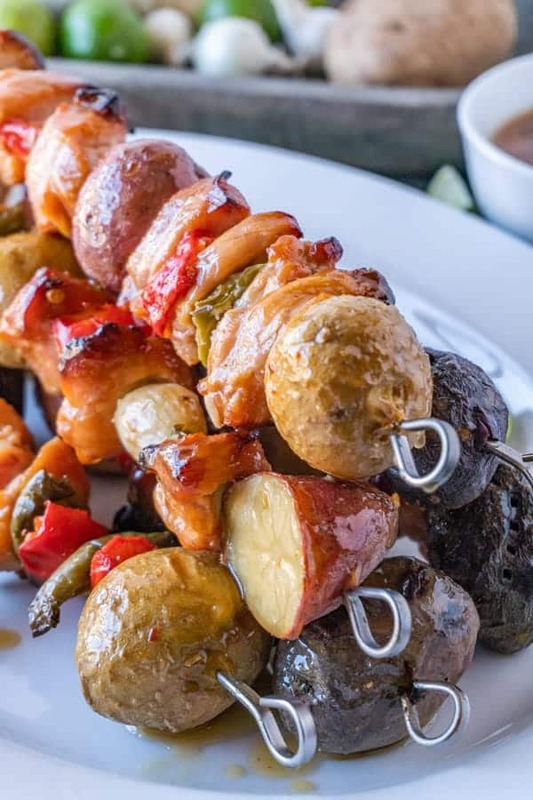 These grilled chicken skewers are quick to make and will have everyone asking for more! A lovely reader asked me a while ago to come up with a new recipe for latest Hearthstone expansion- Rastakhan’s Rumble. If you are new here you might not know that I started out doing recipes inspired by games- especially Hearthstone! I have an entire Hearthstone inspired menu including Chameleos Cinnamon Roll French Toast, Stuffed Evolving Spores, Smoked Angry Chicken, and even Card Pack Cakes! Anyways, although I haven’t been doing as many game inspired recipes, I still love coming up with them when I can! Earlier this week I shared some Peanut Butterfly cookies requested for Overwatch (another fun game!). So, what perfect way to feature the newest Hearthstone expansion, where you fight in an arena and get sold lots of goodies sold on a stick than these chicken skewers! If you don’t know what Hearthstone is that’s totally okay- this Chicken Kebab recipe is still for you! Take me to the recipe for Chicken Skewers already! Thank you so much for wanting to get straight to my recipe! If you don’t want to read my super helpful tips and tricks and get straight to this delicious Chicken Skewers – you can simply scroll all the way to the bottom of this post for the full printable FREE recipe! Enjoy! How to make chicken skewers? Marinate the chicken for at least 2 hrs. Par-boil the potatoes for 10 minutes in boiling water. 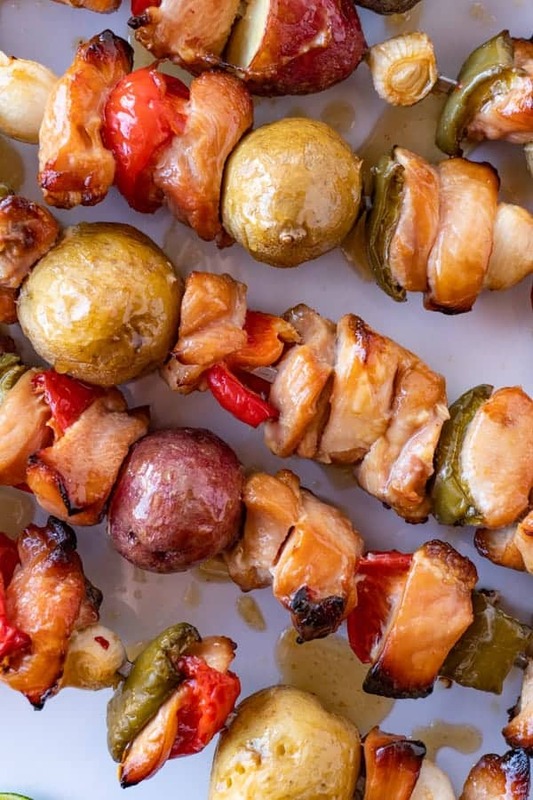 Assemble the skewers with potatoes, chicken, pieces of bell pepper, and pearl onions. How do you grill skewers? Grill over medium-high heat for 10-12 minutes or until chicken is cooked through. Turn the skewers ever 3-4 minutes. When the shish kabobs are done remove from heat and enjoy! Use the remaining sauce to dip your tasty grilled chicken skewers in! Grilled Chicken Skewers are so easy to makes and soooo delicious! Can you prepare kabobs the night before? Yes! 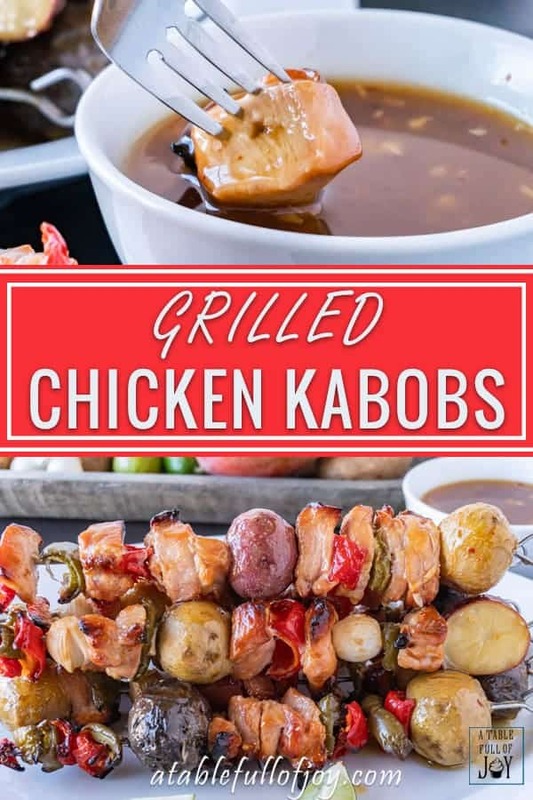 You can marinate the chicken over night or you can marinate the chicken for 2 hrs, then assemble the kabobs, store on a baking sheet and cover with plastic wrap. Keep them in the fridge and bring them out when you are ready to grill the next day! How long do shish kabobs take to grill? Only 10-12 minutes! Make sure to flip the skewers every 3-4 minutes. 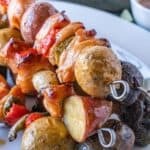 What should I serve with chicken kabobs? I recommend whipping up some of this grilled blue cheese potato salad, some deviled eggs, and this easy bread! Then finish the evening off with a watermelon slushy or cinnamon toast crunch bars! 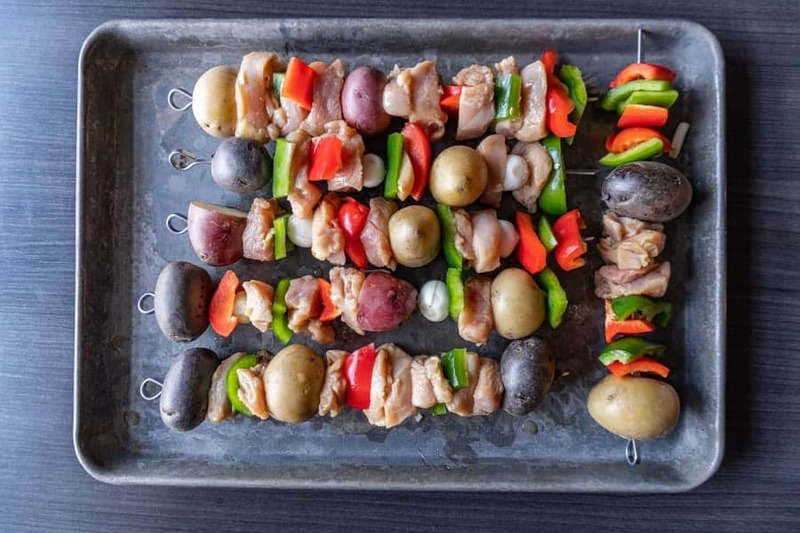 You guys are going to love these kabobs! Make sure to check out my delicious shrimp kabobs too and let me know if you want to see a certain recipe! Easy and delicious chicken skewers with the best dipping sauce! These grilled chicken skewers are quick to make and will have everyone asking for more! 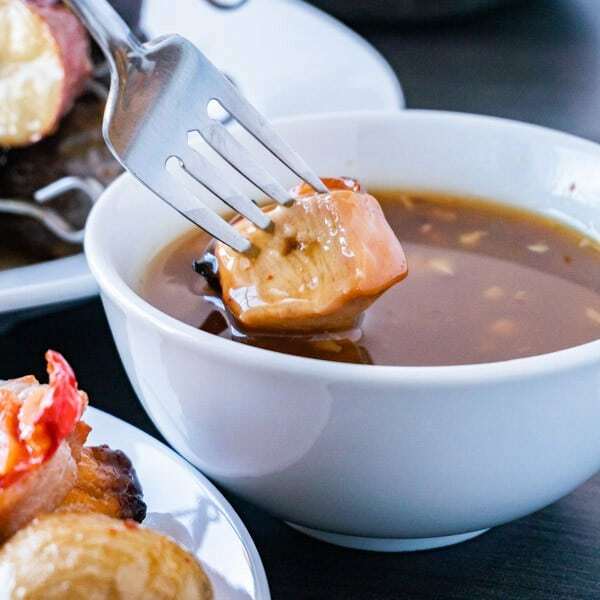 Combine vinegar, ¾ cup water, minced garlic, lime juice, honey, soy sauce (or coconut aminos), sesame oil, red pepper flakes, and ginger in a medium sized pot. Bring to a boil over medium heat. Boil for 5 minutes, stirring constantly. Mix together the cornstarch and 1 tbs of water in a small bowl, then add it to the sauce pan with everything else. Bring mixture to a boil then reduce heat and simmer 10-15 minutes. You want the sauce to thicken enough to coat the back of a spoon. Once the mixture is done simmering remove from heat and allow to come to room temperature. It will thicken even more as it cools. While it’s cooling, slice your chicken breasts into 1-inch chunks. Place in a Ziploc bag or another air tight container and add 1 cup of the sauce to the bag, coating the chicken. Make sure to not get any raw chicken in the rest of the sauce since you will use that for dipping. Allow to marinate 2 hrs or overnight. A half hour before the chicken is done marinating, rinse your potatoes. Bring a medium/large pot filled half way with water and your potatoes to a boil. Boil the potatoes for 10 minutes. Remove from water and set aside. They should be partially cooked and will finish cooking on the grill. Cut your bell peppers in large cubes. When the chicken is done marinating assemble your skewers*. 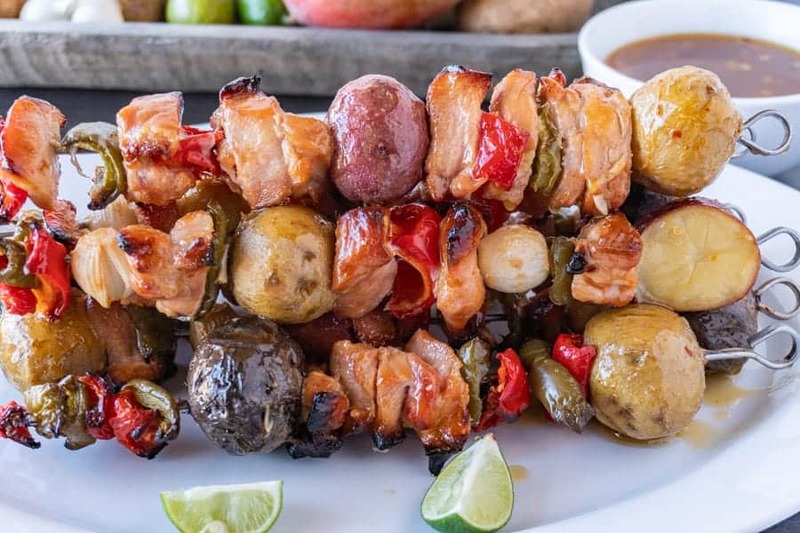 I like to stack each skewer with a good amount of chicken, a few pearl onions, the different colored bell peppers, and at least 2 potatoes. Cook your chicken skewers on medium high for about 10 minutes. You will want to flip them 2-3 times during this. I like to also set aside a ¼ cup of the marinade to brush on to the skewers when I flip them- but once again to don’t contaminate all of the sauce with the uncooked chicken. When the chicken is full cooked remove from the grill and enjoy! Use the rest of the marinade as a tasty sauce or save if for dipping pot stickers in (my favorite!). *If you are using wooden skewers allow them to soak in water for 10 minutes before assembling. This will keep them from catching on fire!